128 days ahead of the 2018 Asian Games, a Campaign of Sport Come Movement followed by the whole range of Ministry of Youth and Sport is done through cycling event around the complex of Gelora Bung Karno Main Stadium, Senayan, which becomes the main venue of the most prestigious sport event of the countries in this region of Asia. The Ayo Sports Movement campaign is conducted to cultivate the spirit of exercise as well as inflame the spirit of Asian Games 2018 is led directly Minister of Youth and Sports, Imam Nahrawi, Wednesday (11/4). “This year is the year of sport, the year Indonesia is once again believed to host the biggest sporting event after the Olympics. This morning, the spirit towards the 2018 Asian Games we will start from here, “said Menpora when starting cycling activities starting from the page ministry. 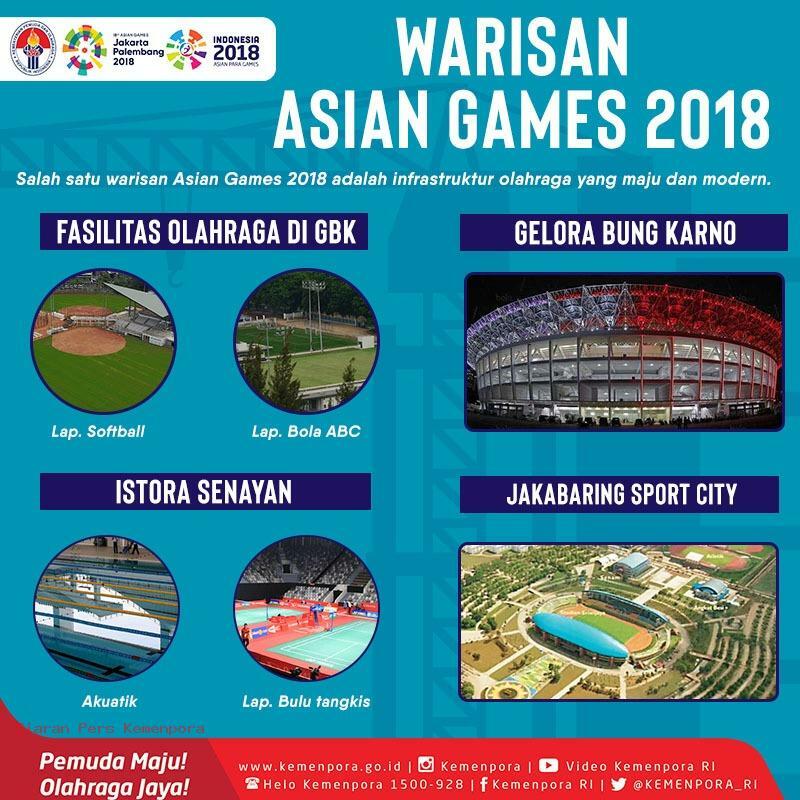 Menpora said, there are 2 important things as an inheritance that will be left for the Indonesian nation from the 2018 Asian Games, namely; 1. The availability of advanced sports infrastructure and world-class quality, and 2. The people who exercise. “There are many sports venues that we have renovated in Jakarta, Palembang and West Java and surrounding areas, which will soon be completed completely. Not least the state money we have to spend, our task now is to succeed this event in terms of organizing, achievement, administration and the impact of economic empowerment for the community, “said Menpora again. “Since the beginning of the year, I have come to one sport at a time, to know the obstacles in the National Training Center and to give moral support to the athletes so that the winning mentality is embedded in them as host we have big capital in the form of full support from the community,” explained Imam. Furthermore, he said, currently the national training camp of 40 sports is underway in various places, and several branches are undergoing various series of trials at home and abroad. Support that people can give to athletes is to inflame the spirit of exercise. This Bangkalan origin minister also mentioned that the momentum of Indonesia as the first host in 1962, has proven that the Asian Games is not only a sports competition but a place of honor and dignity of the nation, because at that time Indonesia was not only a successful organizer, but also successfully ranked 2nd in terms of achievement. “The spirit of sports for the people through the Sport Ayo Movement is done to change the paradigm that exercise is only for elite athletes, because sport is the right of the whole society without exception, because participation in the sport is the basis of the birth of sports achievements,” he explained. Cycling (gowes) from Sabang-Merauke, passing through 34 provinces and 70 districts throughout Indonesia, which will start in Jakarta and end in Bali. Football competition among students who are followed from age level, U-12, U-14, U-16 and Students from 372 districts / cities throughout Indonesia. Cultivate sports from village level competitions in 6 sports: Volleyball, Football Takraw, Badminton, Table Tennis, Football, and Athletics. Programs that invite the public to play and exercise with a national standard ball. World, Guinness World Records dated 5 August 2018 along the road from Gelora Bung Karno to the Palace. 2030 RI will be the top 10 countries of the world economy.